Thanks to Becca’s fantastic research, we found ourself in a little apartment opposite the 250-year-old temple. 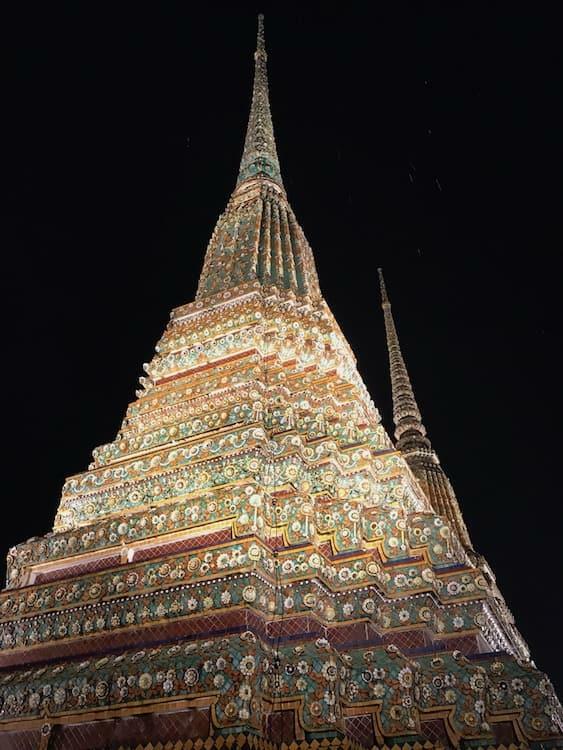 Not only was it incredibly cheap, but it also had amazing views over Wat Pho at night (If you’re interested in staying, the name of the hotel was Chetuphon Gate). 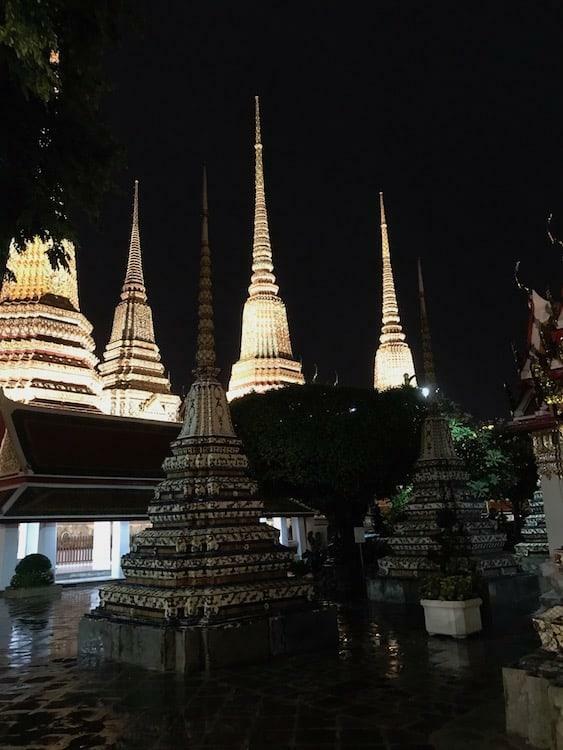 We had visited the temple a couple of days before, but after our move to the centre of Bangkok we were close enough to Wat Pho to be out and about after dark. 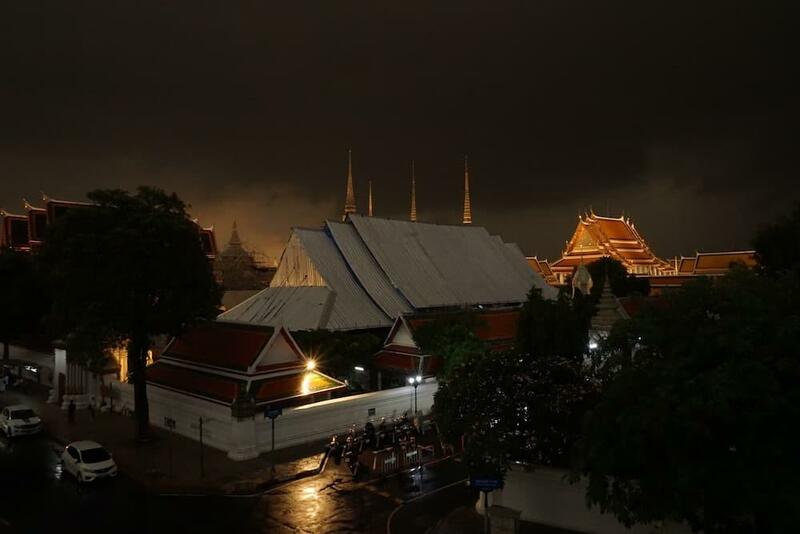 And it turns out not only is Wat Pho open for its advertised hours of 0900-1700, it also keeps the gates open in the evening until 2100. Oh, and did I mention it’s free to walk around!? We headed in – and had the place to ourselves. Entry at night is via the south gate on Chetuphon Road. 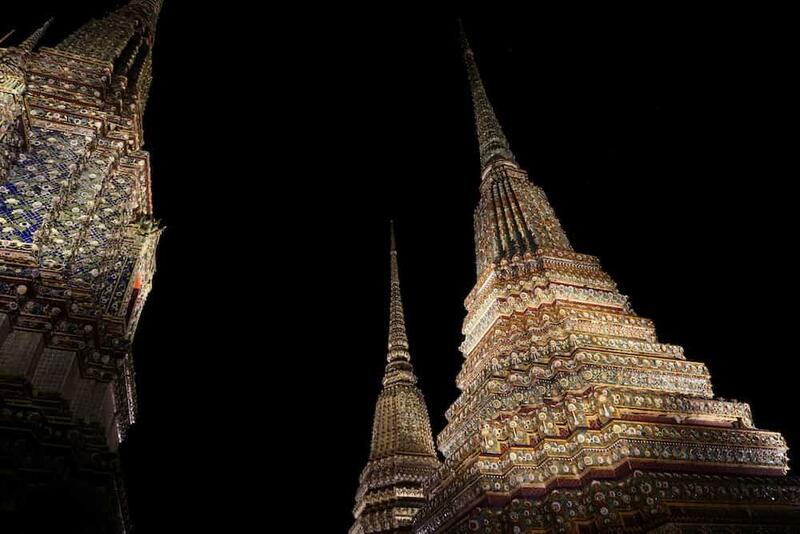 The grounds stay open until 2300, the listed hours of 0800-1700 are for the inside areas such as the Reclining Buddha. There is no entry fee at night. 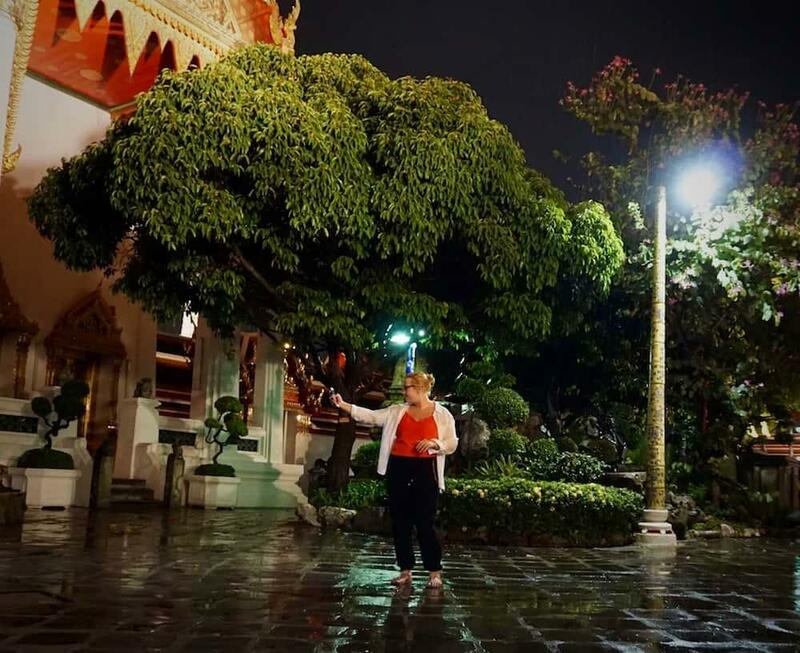 You are allowed to use camera tripods at night, unlike during the day. The grounds are nicely lit up for photographs. The weather had been poor (it was still raining), so this may have contributed to us being alone here, sometimes it helps to be British and not afraid of the of a downpour. Regardless of the weather, this was one of those experiences that you know at the time will be hard to shake off. 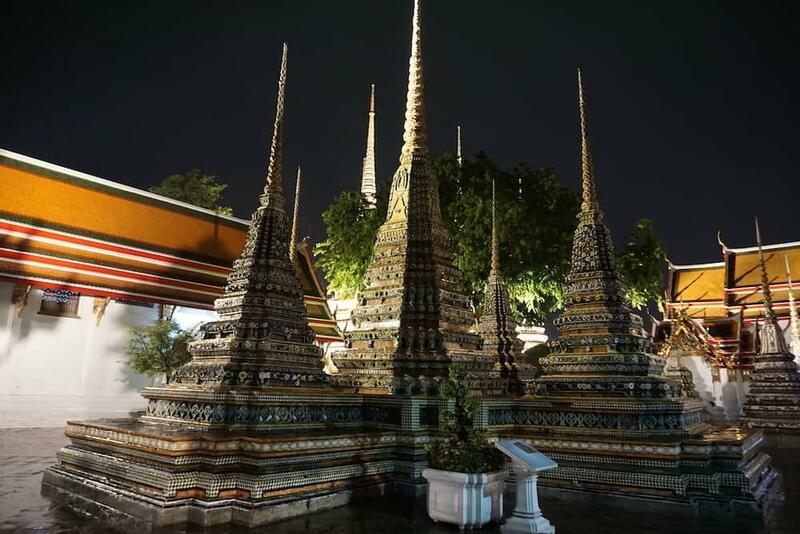 It felt like being an explorer, happening on some ancient city in the middle of the night, the first to set eyes on the place for hundreds of years. I’ve had this feeling a few times whilst travelling – sitting watching a lion kill at night, wandering over the last crest of a hill towards Machu Picchu, paragliding over the Alps – but it’s surreal, my spirit seeming to be lifted out of my body and watching me from above. It’s looking down and urging me to drink it all in. Twenty minutes of experience that will create a lifetime of stories. Other than the sounds of monks chanting and the odd stray cat there was nothing at all to disturb us (not that either of these really did!). When it’s not full of tourists, your truly appreciate how vast this space is. 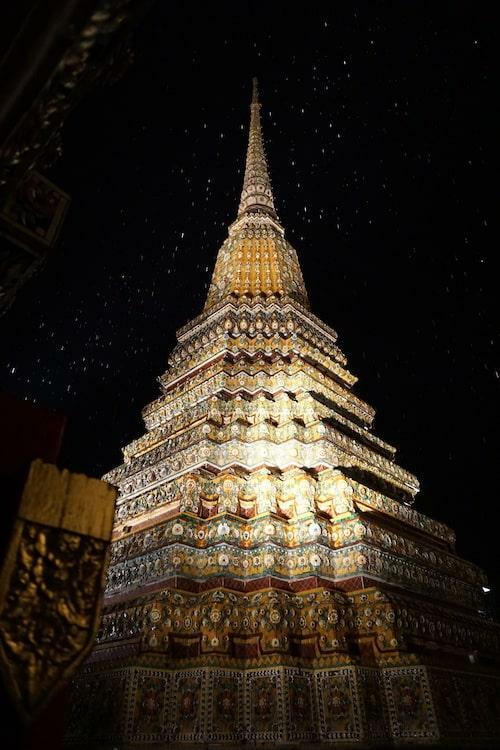 80,000 square metres of ornately decorated chedis, gold leafed temples, and one of the largest collections of Buddha images in the world (over 1,000). At one point I lost Becca completely! When I found her she was recording a video to share with our family. It’s only when I watched it back I appreciated just how lucky we are. I have uploaded it to YouTube and put it into the post below if you’re interested in a watch. There are a couple of things to note before you head in. 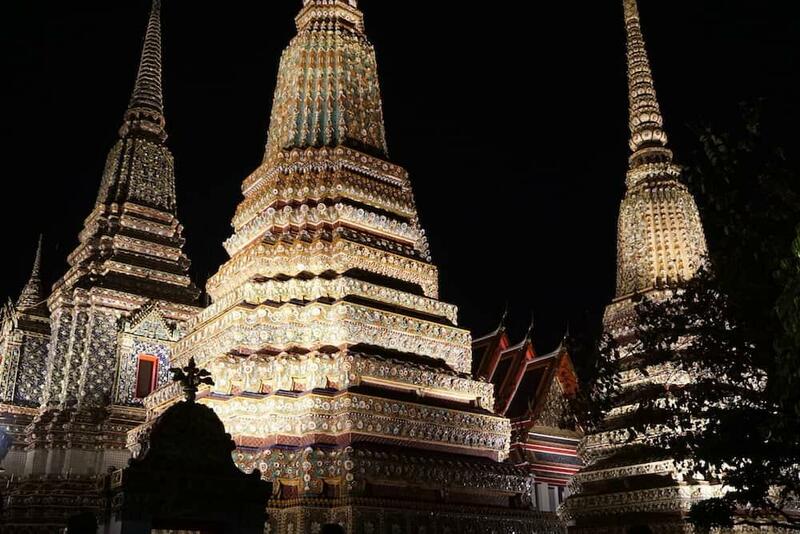 Firstly, the big attractions such as the Reclining Buddha are closed in the evening. Haha, we got approached in exactly the same way! Ours was actually a tuk-tuk driver who then wanted to take us off somewhere else. Thankfully we had read up on it though! Unfortunately we’d been caught out the day before by a slightly different scam, this one involving a friendly guy in the street, and a recommendation to go on a boat trip. It’s so disappointing, as these people erode your trust in everyone. After meeting them you assume everyone’s got an agenda, and pass up some fantastic opportunities because you’re worried about them. They need dealing with! 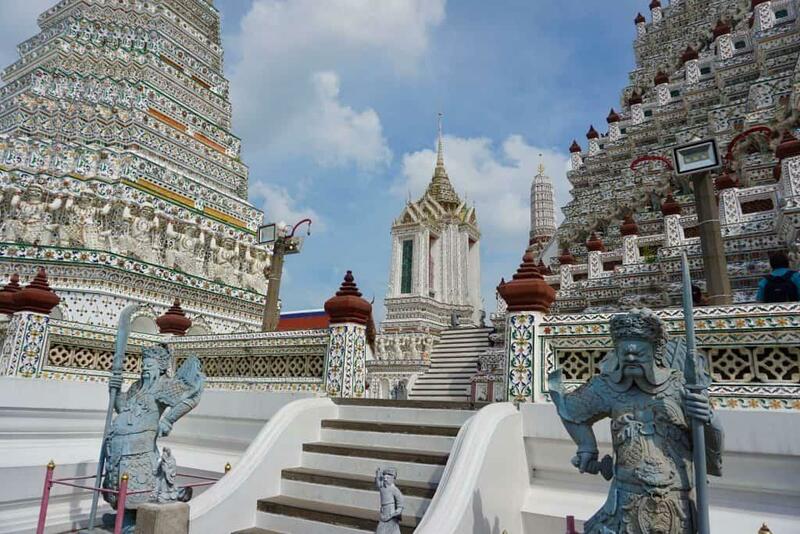 Previous Post Wat Arun: Is this the most beautiful place in Bangkok?